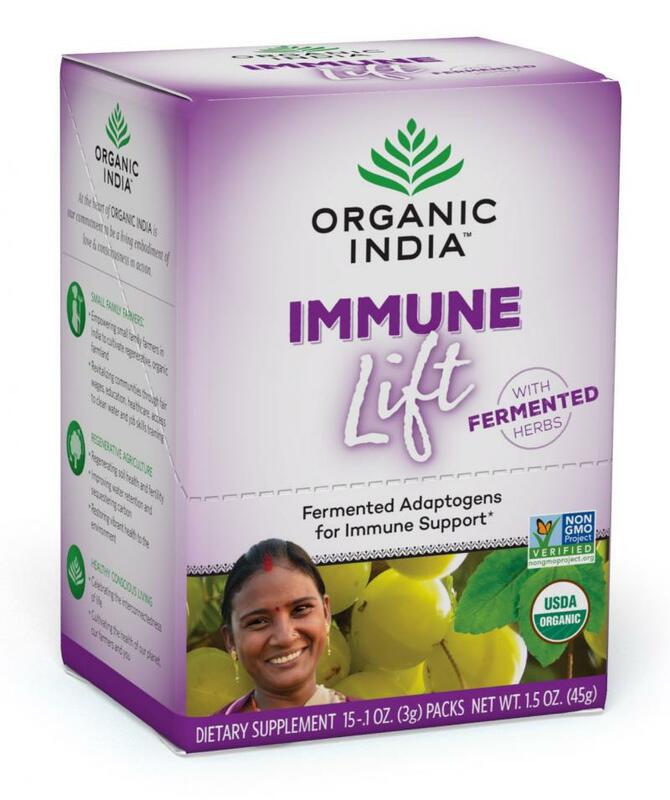 Organic India Immune Lift combines herbs and adaptogens to support a healthy immune system and natural stress response. Amla has been used in Ayurvedic treatments for thousands of years to provide rejuvenation, and as a tonic for overall health. Tulsi, or Holy Basil, has been utilized for over 5,00 years to support immunity, stress response, and the body's natural detoxification process. The herbs are fermented using complementary probiotic strains to improve digestibility and biological enrichment. >convenient single-serve format >kosher >non-GMO >sustainably sourced >USDA organic Suggested Use: Add one packet to your favorite beverage, smoothie or soup. Mix well or blend. Consume with healthy fats for optimal absorption. Ingredients: Organic Fermented Amla - 2 g, Organic Fermented Tulsi Blend (Holy Basil/Ocimum Sanctum) [Krishna and Rama Varieties] + East Indian Basil (Ocimum Gratissimum) [Vana Variety] - 1 g, Sodium - 10 mg, Potassium - 53 mg, Iron - 1 mg To enjoy while pregnant or nursing, consult a physician before use.